Help your chosen Charity, Club or Sports Team raise valuable funds, all while guests enjoy themselves and give generously playing Fun Casino Games. We can help you cater your night to fully maximise fundraising capabilities. ​Event tickets can be sold and donations can be given from guests in exchange for fun money notes or casino chips. If they run out of chips they can donate more money to receive more. 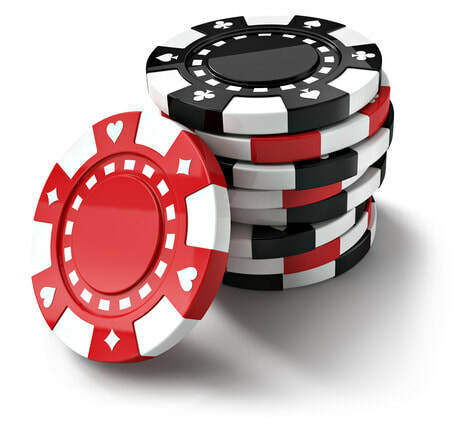 For example £10 can acquire a further $100 worth of Fun Casino Chips, and this is a great way to raise more funds. We even provide slightly better odds on our Casino Games to ensure people have the sense they are Winning, thus having fun, and Donating even more money! Finally the Event Organiser is welcome to obtain Sponsorship for each Casino Table to further increase fundraising! Marketing displays for Sponsorship are welcome to be displayed around the tables and of course Businesses can Donate Prizes! You pay Fun Casino Nights a flat fee dependent on how many tables and how long you want the hire for. Whatever you raise beyond that is profit for your cause. We are proud of the success we have had in raising valuable funds for a variety of different causes. Nothing promotes digging deep in pockets and donating large sums quite like gambling on our impressive casino tables! 1. You can offer the first say $50 worth of casino chips as part of your event ticket to sell as many tickets as possible to raise funds for your cause. Make sure to choose a correct ticket price to cover your costs. If guests lose their chips over the course of the night they can buy back in by donating. 2. If you want to maximise fundraising capabilities, don't give away any casino chips as part of your event ticket, instead anybody who wants to play has to first donate to buy casino chips. We help encourage large donations from your guests with our laminated posters that can be distributed amongst tables and put up on walls. 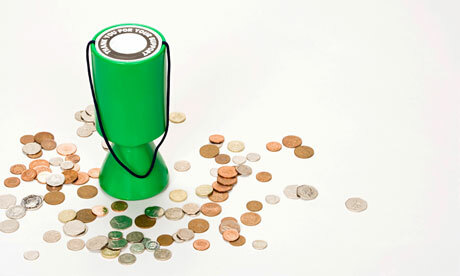 We offer a special deal to encourage people to donate £20, instead of £10. They get $300 for £20 instead of $100 for £10. We have found this works really well and with events of over 100 people you can expect donations well in excess of £1000! ​All donations handed over go to the charity, we do not keep any. 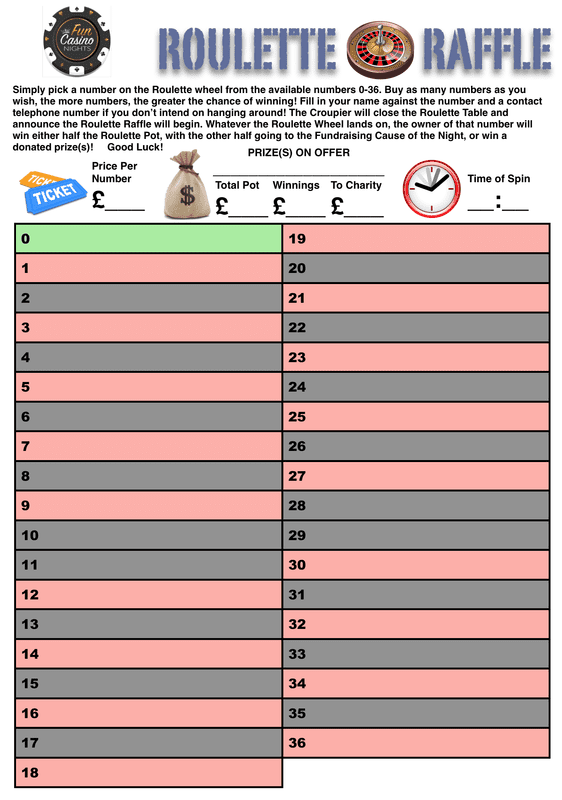 We can at your request, help to organise Roulette Raffles, whereby each number from 0-36 is raffled off at a cost of say £2 or £5 each, in the latter instance giving 37x5 = £185. Then at a set interval, the Croupier will announce the next spin on the Roulette table is for the Roulette Raffle. The roulette wheel is then spun and the number it lands on reveals the winner of the Raffle, who could win half of the total pot, 185/2 = £92.50. For greater fundraising the winner can win a donated prize with all the Roulette Raffle takings going to charity. A great game of excitement and fundraising at the same time. This can be repeated throughout the night with the Event Organiser explaining the concept to guests and selling the Raffle numbers. We provide the raffle sheets and envelopes so you can go around and sell roulette raffle numbers! There's nothing that encourages large donations than the hope of winning some great prizes from their casino chip haul. We suggest approaching local business to see what they can donate for prizes for you to award to the top chip winners, or hand out as winner of the roulette raffle! 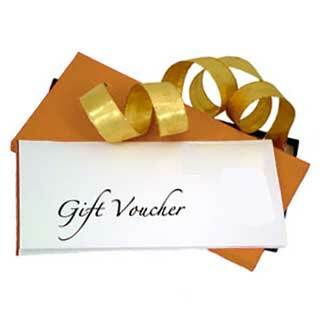 ​With all of our Fun Casino Nights we complete a prize giving ceremony to award the biggest chips winners with a prize. This keeps the competitive edge to the nights proceedings and encourages donations. Want our help in putting together an Event Ticket to sell to guests? We can put together a design that includes your charity logo, event details and even a credit for the guest's first amount of chips. 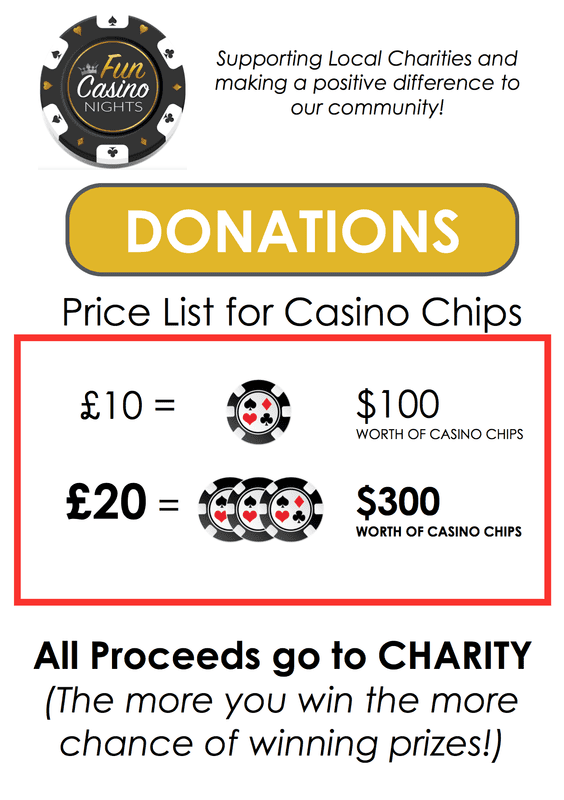 ​These are perfect for selling as event tickets and in exchange for donations on the night as guests are encouraged to donate to receive more casino chips. Speak to us with your ideas and what you would like to include in your personalised money notes! "On behalf of Melton St Audrys Football club I would like to say a huge thank you to Fun Casino Nights for such an amazing evening. 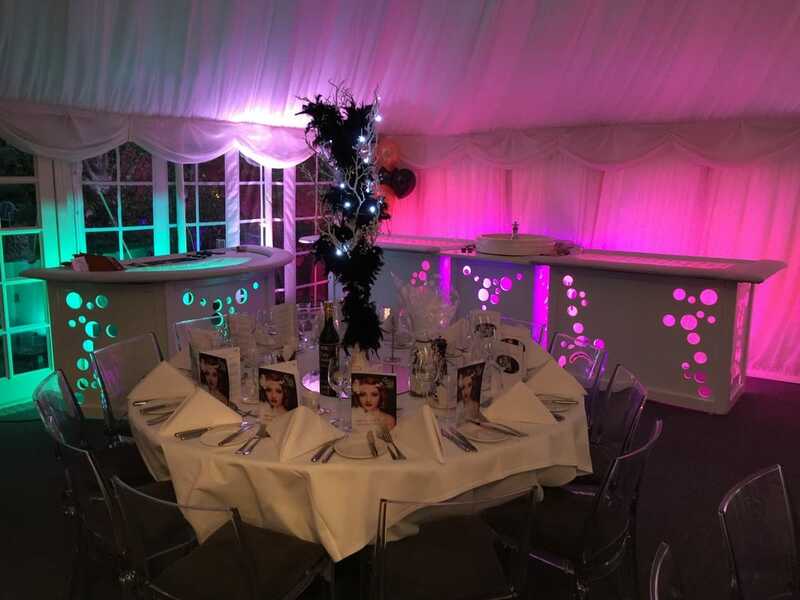 Everyone who attended the event had a great evening and this is largely down to the time and effort put into the evening by Fun Casino Nights. The room was styled in 007 James Bond and several people commented that it's the best the Social room has ever looked for an event. Everything from the stylish tables to the decor and James Bond Music. 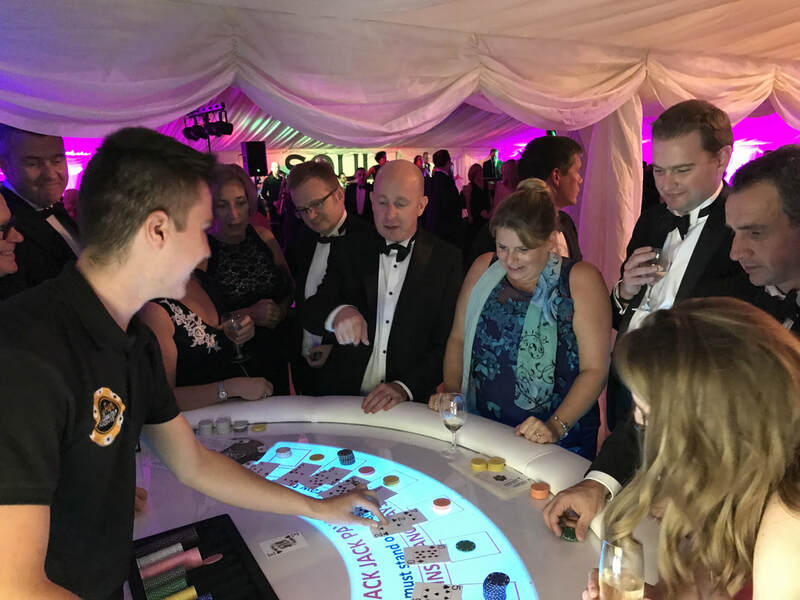 Fun Casino Nights made the event a real success from start to finish and always in frequent communication to ensure everything was in place leading up to the event and then on the evening the team were very approachable- I cannot fault them one bit. We raised £770 fro our football club, which will be invaluable in the upcoming season! 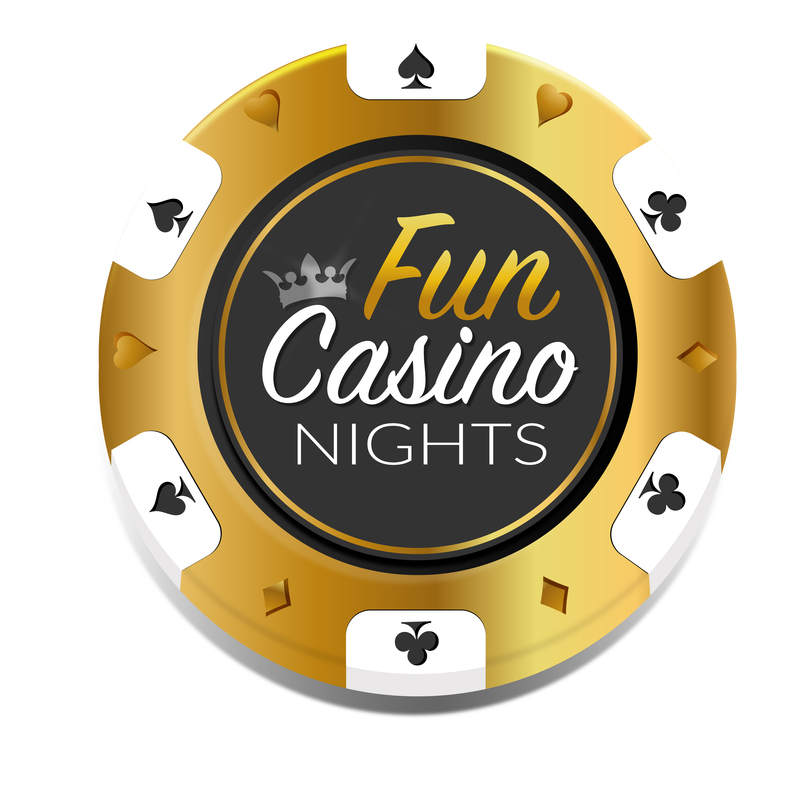 I am already looking to organise another casino night and would 100% recommend Fun Casino Nights to anyone without hesitation."